Some 10,000 people marched Saturday through the Scottish capital of Edinburgh to protest U.S. President Donald Trump, while police tried to find a paraglider who breached a no-fly zone and flew a protest banner over the golf resort where Trump is staying. 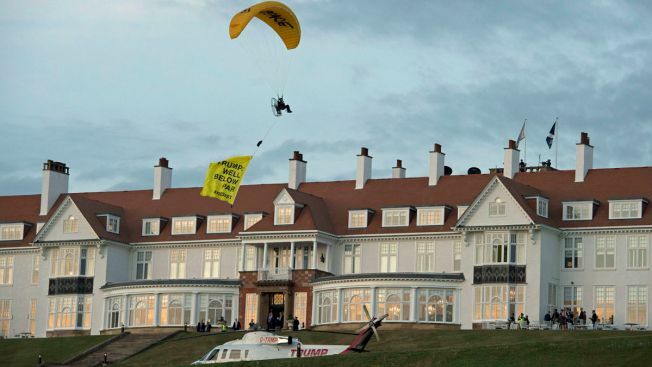 The glider carried a banner reading "Trump: Well Below Par" over Trump's Turnberry golf resort in western Scotland on Friday night to protest his environmental and immigration policies. Greenpeace, in a statement, claimed the protest forced the president to take cover, saying "as the glider appears overhead the president can be seen making for the entrance breaking into a trot." The environmental group said it had informed police about the stunt 10 minutes before the glider arrived. Detective Inspector Stephen McCulloch said the protester breached a no-fly zone over Turnberry hotel, committing a criminal offence. In Edinburgh, a police helicopter almost drowned out the chants of the protesters, who plan to launch into the sky the giant "Baby Donald" balloon — depicting the president as an angry orange baby. The same balloon flew over anti-Trump protests in London on Friday, when thousands crammed the streets of the British capital to vent their anger over Trump's first official visit to Britain. Trump and his wife, Melania, were spending the weekend out of the spotlight at his Turnberry resort, ahead of his high-stakes summit Monday with Russian President Vladimir Putin in Helsinki, Finland. Jonathon Shafi, of the group Scotland Against Trump, said he wanted to show solidarity with Americans against Trump. "It's not acceptable that a president talks about grabbing women, separates children from their families and gives encouragement to fascist, racists, misogynists and homophobes," he said. 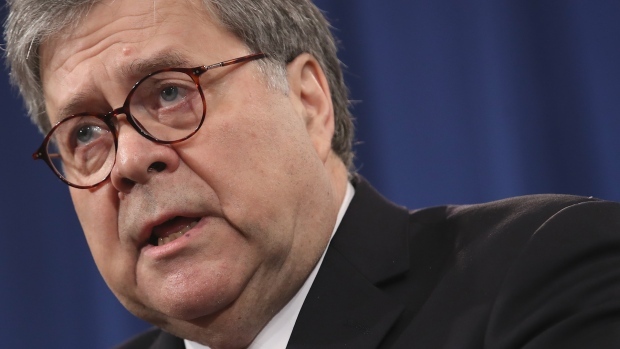 "We are not anti-American, just against Trump and his divisive regime". Eli Roth, 56, from California but living in Edinburgh, said he doubts the U.S. president will take notice. "I don't think anything gets the message across to Trump, but I hope demonstrations like these encourage people in the States to fight the Trump regime," he said. "We need to show that there are people outside America who care about what is happening and that Trump has a global impact."